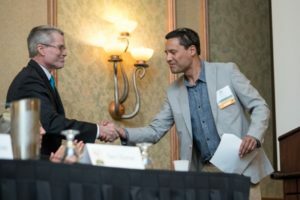 Jim Hafner, Land For Good’s Executive Director, welcomed Chris Beyerhelm, Acting Administrator, Farm Service Agency, U.S. Department of Agriculture at the opening plenary. 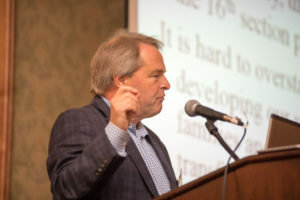 Neil Hamilton, Drake University Agricultural Law Center, discussed how land tenure shapes the future of US agriculture. Savi Horne, Land Loss Prevention Project, spoke to the challenges and opportunities to improve land access and transfer. 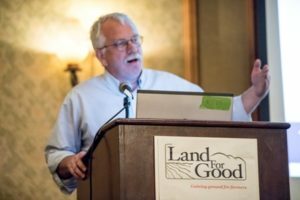 Scott Marlow, Rural Advancement Foundation International, shared his perspectives on land tenure. 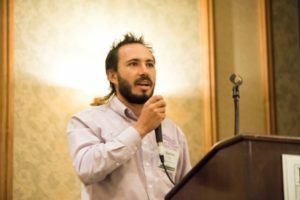 Harrison Topp of Topp Fruits took the stage with other young and beginning farmers and ranchers to share their inspiring stories of land tenure. 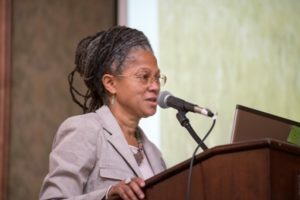 Shirley Sherrod, Southwest Georgia Project, addressed a captive audience at the Racial Equity Challenges in Agricultural Land Tenure. This opening panel set the stage for our conference work together while getting grounded with data and analyses from USDA. This provocative session laid out values-based and practical challenges that guide–or thwart–our efforts to improve land access, tenure and transfer. Panelists also shared their perspectives on the issues. Special thanks to panelists: Neil Hamilton, Drake University Agricultural Law Center, Lead Speaker; Dan Bigelow, USDA/Economic Research Service; Savi Horne, Land Loss Prevention Project; and Scott Marlow, RAFI. Public policies can help advance our land tenure objectives or pose obstacles. Where are the promising levers? What is realistic? What can we do from the field? 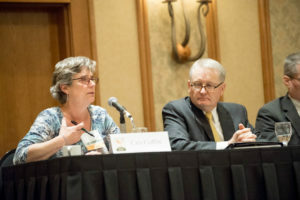 These policy experts talked about the policy landscape at federal, state and local levels. Special thanks to panelists: Chris Beyerhelm, USDA/Farm Service Agency; Don Brown, Colorado Department of Agriculture; Cris Coffin, Land For Good; and Gary Matteson, Farm Credit. Young and beginning farmers and ranchers shared their stories about land access. These inspiring operators from different commodities and regions conveyed their land tenure path and their perspectives on what’s working and what’s needed. Special thanks to panelists: Tess Brown-Lavoie, Sidewalk Ends Farm, Rhode Island; Harrison Topp, Topp Fruits, Colorado; Dustin Stein, Stubborn Farm, Colorado; and Javier Zamora, JSM Organics, California. US agricultural land tenure has a long and fraught history, especially regarding farmers of color and other disadvantaged groups. Our panelists brought deep subject expertise to shed light on current challenges, and to provoke all of us to do more to promote equity in how all producers access, hold, and transfer farms and ranches. Special thanks to panelists: Stephen Carpenter, Farmers Legal Action Group; Janie Hipp, University of Arkansas; and Shirley Sherrod, Southwest Georgia Project. Indeed! Our panelists translated their conference experiences and observations into key takeaways that inspired and challenged us all. 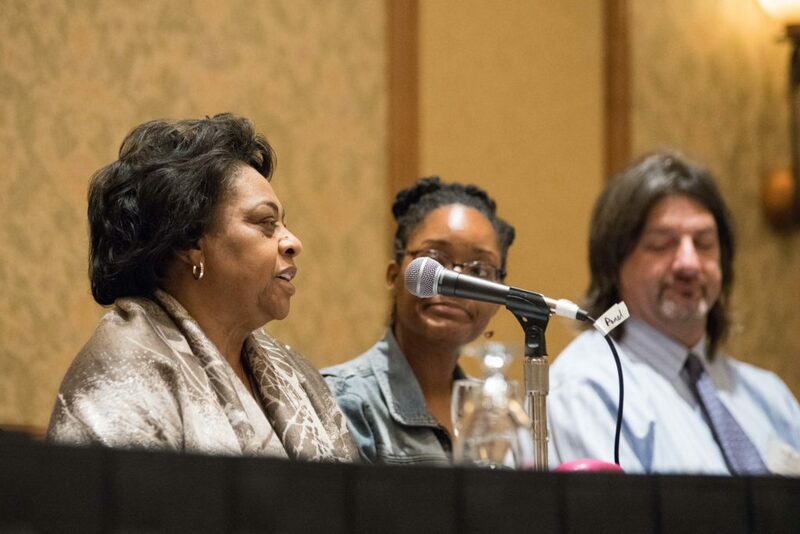 Special thanks to panelists: Poppy Davis, Univ. of Arkansas School of Law; Julia Freedgood, American Farmland Trust; Lilia McFarland, USDA; and Monica Rainge, Federation of Southern Cooperatives.